I began reading about the many players who are suing the NFL seeking medical support and compensation for the permanent, debilitating brain damage caused, they allege, by football. I saw them interviewed, sometimes struggling to communicate or walk. I read their stories. It was tragic and heartbreaking. And, the NFL couldn’t be bothered. Oh no, it couldn’t be us! We’re America’s game. Why do you think they call it the SUPER Bowl? Because we are SUPER! ESPN has posted the lawsuit here. Many jobs are risky, and most are nowhere near as lucrative as football. But, while players are well compensated for their work, that doesn’t mean they forfeit their right to a safe workplace or a healthy future. But, life is also about being mindful of the risks. Owning up to the risks. And, reducing the risks whenever possible. I believe that the NFL hasn’t done enough to be mindful, own up, or reduce the risks. I believe they have been deceitful, greedy, negligent, and criminal. Don’t misunderstand. I know that Major League Baseball isn’t all sunshine and sweetness. They’ve got serious drug issues plaguing their sport for one thing. But, I will give them credit. When SF Giants Catcher Buster Posey broke his leg in a horrific home plate collision in 2011, people talked about the potential need for a rules change to avoid future injuries. When Oakland A’s Pitcher Brandon McCarthy was severely injured by a line drive to the head this summer, people talked about it. MLB says that requiring protective headgear for pitchers is now on the “fast track”. I know, talk is cheap. And, really, these might be more freakish injuries, rather than the culmination of long history of debilitating and permanent damage being caused by the kind of callous disregard for safety that, I believe, goes on in football. I mean, maybe NFL officials really do believe their game is safe. Maybe they think these damaged players are just victims of unfortunate coincidences. They couldn’t have known their game was crippling people – causing permanent brain damage – and then not done anything. Could they? Who would do something as callous as that? 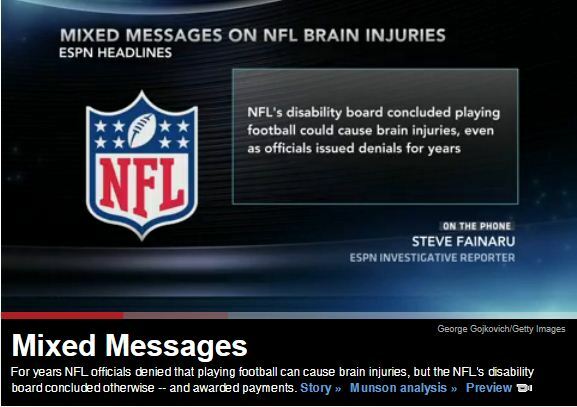 At the very same time that the NFL has been fighting lawsuits, denying there are brain damage dangers, insisting their players are safe, and continuing to do pretty much nothing to reduce the risks, they were giving disability benefits in secret to at least three retired players who, they determined, had been “totally and permanently” disabled by head injuries received during their careers. ESPN’s Outside the Lines and PBS’s FRONTLINE have been working together on a documentary about football and brain injuries, based on an investigation by ESPN reporters Mark Fainaru-Wada and Steve Fainaru. According to the ESPN/PBS report, the NFL’s Mild Traumatic Brain Injury Committee concluded in studies that spanned 2003 to 2009 that there was no risk. No player, the NFL publicly insisted, had been permanently injured by concussions received during games. However, board documents obtained by Outside the Lines and FRONTLINE show that the NFL retirement board determined in 1999 that repeated blows to the head had left [Mike] Webster, who spent most of his 17-year career with the Pittsburgh Steelers, “totally and permanently” disabled. The board based its findings on the diagnoses of five doctors, including a Cleveland neurologist hired by the board to examine the player. The doctors described Webster as “childlike” and showing signs of dementia. Webster died in 2002 at the age of 50. The reporters confirmed that two other unnamed players were also deemed permanently disabled by the game and received benefits from the NFL. The reporters believe that there may have been others. So, the NFL knew all along. And, they covered it up. And, they’re doing almost nothing to protect today’s players from similar fates. The Concussion Blog reports that there have been 108 concussions in the NFL through Week 11 this season – nearly 10 a week. The Blog reports that the number of concussions that occurs each week goes up as the season wears on, presumably due to the cumulative effect of the game on one’s brain week after week. http://www.theconcussionblog.com tallies the number of concussions each week during the NFL season. 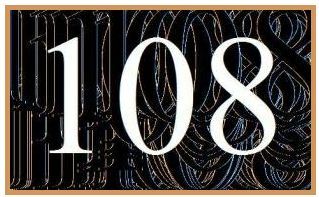 108 through Week 11. Earlier this month, the NFL announced that they would be “addressing the issue” of brain injuries in football. I hope they do more than just talk. Read the ESPN/PBS story here. And, as reported on ESPN here. ESPN published a heartbreaking 5-part series on the life and death of Mike Webster here. 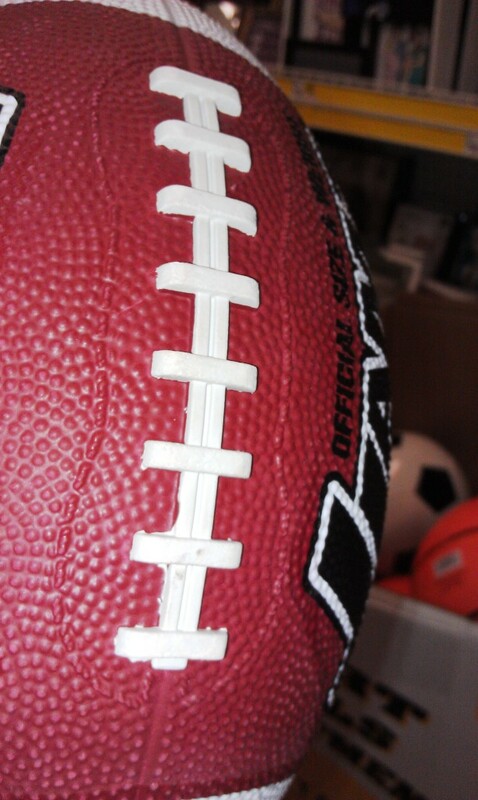 No football. No Super Bowl. No Beyonce at halftime. Don’t tell me how the 49ers are doing. I don’t want to know. August 23, 2013 ~ I’ve been meaning to update this post for some time. I wish more people would find it, because I don’t think there’s been a single bit of improvement in protecting NFL players from traumatic brain injuries. But, I’m a true Pollyana and I always hold out hope. And, then today I read this. ESPN is ending its collaboration with PBS and ending their role in this important work investigating the NFL and head injuries in football. And, it makes you wonder, doesn’t it? Why would you stop working with PBS on such an important issue? Their collaboration has continued to find troubling facts that indicate that the NFL not only could do more, but that they are actively working to cover up the situation. Read about the ESPN “bail out” here. This entry was posted in Baseball, Life and tagged Buster Posey, concussions, football, injuries, NFL by Jackie, The Baseball Bloggess. Bookmark the permalink.